Obey all traffic control devices and routing signs. Maintain a safe stopping distance behind moving cars. Do not pass vehicles on the right. Walk your bike across streets and intersections. Be courteous to pedestrians, motorists, and other bicyclists. Avoid traveling too fast down hills or on rough or slippery roads. Ride with traffic, not against it. Use hand signals to communicate with motorists. 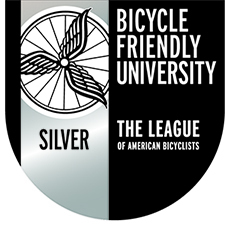 The League of American Bicyclists offers a series of educational videos covering a wide range of topics from how to choose a bicycle to proper lane positioning (as shown above). Feel free to check them out for bike safety tips! Lock your bicycle every time it is left unattended—even if you’ll only be gone for a minute. Secure your bicycle to a rack with a high-quality U-lock and a case-hardened chain. A cable lock alone isn’t strong enough. To lock your bicycle properly, place the chain through the bike frame and through one or both wheels, then wrap the chain around a bike rack. Park your bike in a well-lit area. Having trouble accessing a bike rack due to snow? Please contact the Office of Physical Plant's Service Desk at 814-865-4731 or send an email to snow@psu.edu.